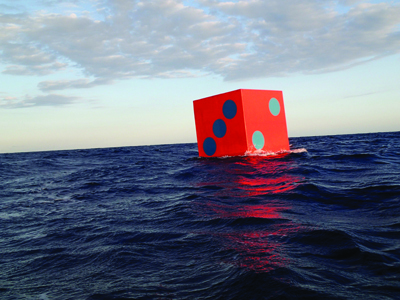 An 8-foot-tall Aqua Dice sculpture created by Max Mulhern ’84 floats away into the Spanish Atlantic after being launched by the artist in December. At the time of publication, the two dice were still lost at sea. Photo by Max Mulhern. At night amid a merciless gale and at placid sunrise on calm seas, Max Mulhern ’84’s Aqua Dice haunt the ocean. Now lost in the Atlantic, the bright-orange, blue-dotted dice drift randomly, waves lapping and cresting against their right angles. Mulhern ponders the wayward 8-foot sculptures every day, often vicariously, sketching them on paper where he imagines them to be. Mulhern’s concept for the cubes derived from many lifelong passions and preoccupations, namely art and the sea. An avid sailor and occasional professional yacht captain, Mulhern discovered a penchant for blending art and bodies of water about 15 years ago when he began placing sculptures on small lakes. In 2008, he launched Drift Ped, a floating upright rectangle fashioned after the boxy, white pedestals that often support sculptures in museums. “A pedestal is supposed to fix a work of art to the ground—I was taking this iconic sculptural constant and setting it adrift, whereby the ocean became a moving base,” he says. Many of Max Mulhern ’84’s recent drawings have reflected his preoccupation with the mysterious journey of his Aqua Dice. Eternal Hazard, the ink and watercolor work shown above, is one of his more abstract pieces about the dice. Launched off the coast of Long Island, N.Y., Drift Ped sank in a few hours, as was intended. Aqua Dice, however, are built of sterner stuff. 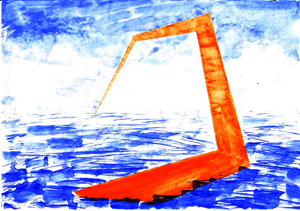 Funded by a grant from the French Ministry of Culture and a successful campaign on the French version of Kickstarter, Mulhern collaborated with a boat maker to engineer the watertight cubes so they might withstand years in the ocean, yet implode upon any significant impact to ensure the safety of other vessels. Equipped with GPS units, the dice were serendipitously (but not purposely) launched at noon on Dec. 12, from the Canary Islands with the supposition that the Trade Winds would spirit them away to the Americas. Although satellite contact dropped off for both dice at about the same time, about two months into their voyage, their journey seemed to be leading them to Morocco. Like Aqua Dice, Mulhern’s own journey was anything but planned. An English literature major at Swarthmore, he fell in with a crowd of artists after college, during a year spent in Paris. He intended to start law school but never returned to the states, instead landing a spot in Paris’ École Nationale Supérieure des Beaux-Arts, where he studied drawing. For the last decade, he has mostly worked in sculpture. Recently he relocated to London where he does art full time along with teaching, blogging for the Philadelphia-based Artblog, and some real-estate management. He speaks of the dice wistfully—in a French-tinged accent—whenever he imagines their fate. 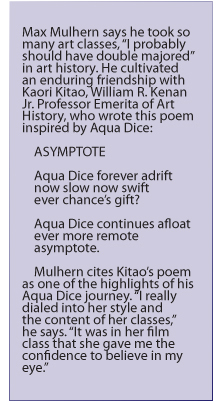 Meanwhile, Mulhern isn’t quite done speculating on his floating sculptures, as the Aqua Dice Facebook page’s many weekly entries suggest. Dice may suggest winning and losing, but Aqua Dice evokes a different brand of loss. He likens them to any creative work that artists must part with and says that he doesn’t mourn the dice’s disappearance.